For today's card, I wanted the verse to be the focal point. The sketch from this week's Sweet Sunday Sketch Challenge seemed perfect for that. Since we are starting to see hints of spring, I thought the pansies would be a good example of one of the beautiful things the Lord has made. They are from the fantastic Bloom & Grow digi set from Deedee's Digis. This set has 6 different floral images that come in pre-colored, outline and layering formats as well as 5 different sentiments. I chose the outline version of the pansies. I colored two sets of them and then cut one set apart to use just one of the flowers. A pearl center and a coat of glitter from a clear Wink of Stella brush marker finish them off. The sentiment panel was matted and then popped up on a doily die. My tip for Top Tip Tuesday Challenge is to use portions of a diecut or layer that will be covered up for matting or other decorative elements. On this card....I didn't have more of the green cardstock used for the doily die. I needed something else green on the card so I cut the decorative corners from the center of the doily. The sentiment panel covers it up and you wouldn't have known if I didn't tell you. LOL It's a great way to stretch your paper supplies. I used a Fiskars border punch to make a lacy border across the card. I topped it with a piece of dark purple cardstock and a strip of pearls. I also used the punch on the bottom of the card front. 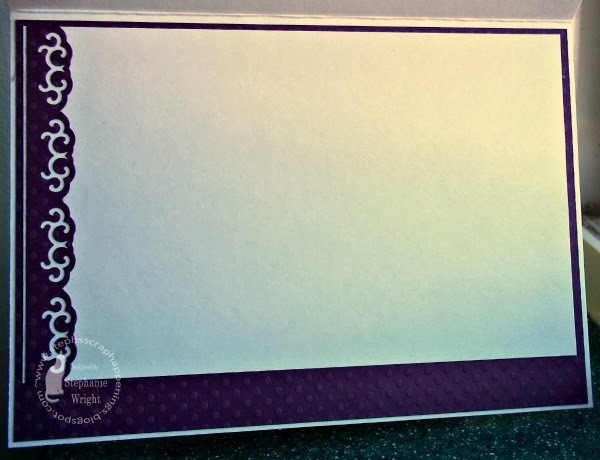 This allows the purple cardstock on the interior to show. I really like the crisp white against the dark purple. More pearls accent this border. For the interior, I reversed the white/purple combo and have a purple punched border layered over the white writing panel. Patterned Paper: Best Creation, Inc. I hope you'll stop by the Word Art Wednesday blog to pick up your free digi and see the projects from the rest of the Design Team. Thanks for stopping by today. I truly appreciate your visit. Beautiful and so elegant. Love the verse and the layout. Beautiful card! and a lovely post too. I've just written on prayer and waiting on the Lord too! 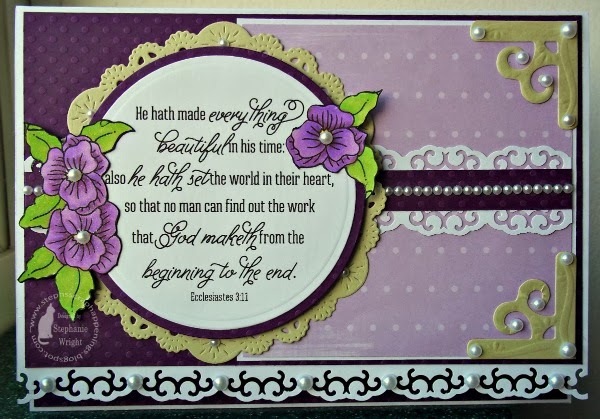 Wow, those purple flowers really look awesome on your beautiful card. What a gorgeous card! Thanks for joining the challenge at Scrapbook Blessings Club! Beautiful card and verse! Thanks for joining us at SBC. Your card is beautiful inside and out. Yes indeed, it's all about His timing and I'm willing to wait on Him! This is quite lovely. 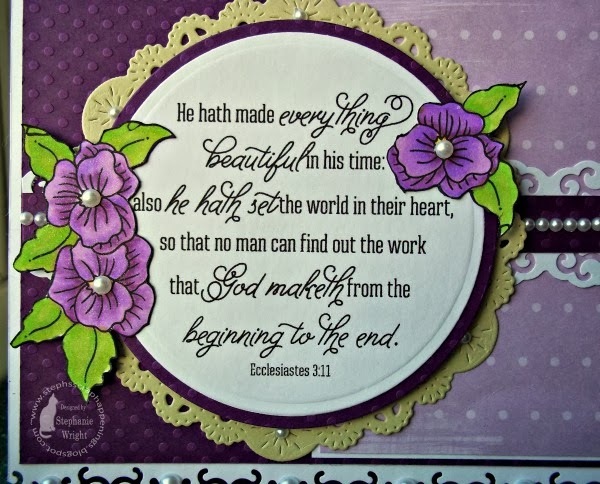 I love how you use scripture on your cards. The pearls add so much to this card. It is a great design too. Another Beautiful card and your sentiment is perfect. Thanks for joining us at the Scrapbook Blessings Club. Fab card, so elegant and a great top tip.